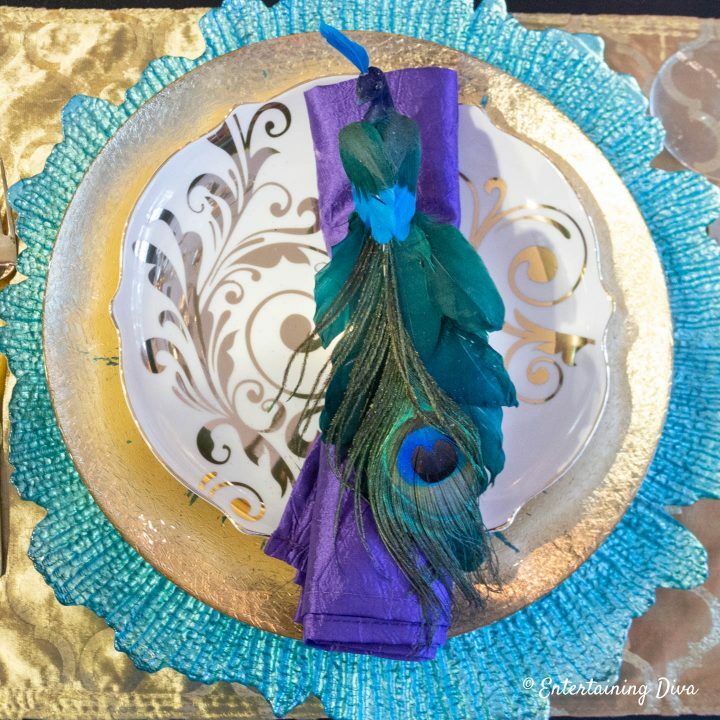 When I was looking for Mardi Gras table decor ideas to go with my Mardi Gras party decorations, I decided to use a peacock table setting instead of a totally traditional Mardi Gras tablescape. I love how it incorporates the colors but still looks elegant. 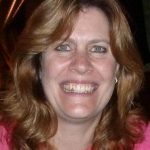 When I was coming up with the decorations for my Mardi Gras party, I was looking for Mardi Gras table decor ideas that went with the purple, gold and green color scheme but still looked elegant. Then I noticed the peacock ornaments on my Christmas tree and decided they would make the perfect inspiration for my Mardi Gras table setting. And in case you’re wondering…no…I didn’t have my tree up all the way until Mardi Gras. This was a New Year’s Eve party. 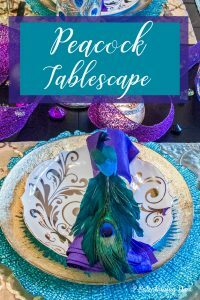 Which is how my peacock-inspired Mardi Gras tablescape came to be. 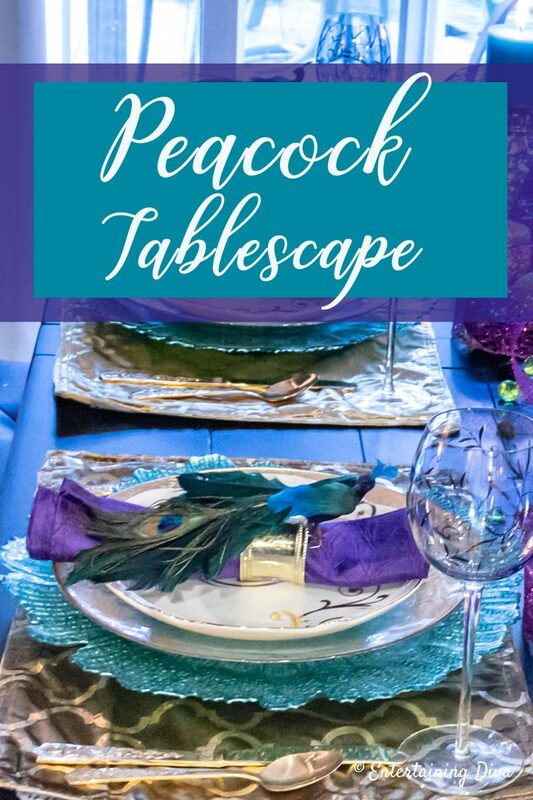 Of course, since there isn’t anything specific to Mardi Gras on this table, you could also use these table decor ideas anytime you want a peacock-inspired color scheme. Since the peacock ornaments* were my inspiration, I started with them. I decided the best way to use them was as decorations on my napkin rings. Since they are clip-on ornaments, I just clipped them on to some gold napkin rings*. And voila…I had a peacock table decor. How easy is that? 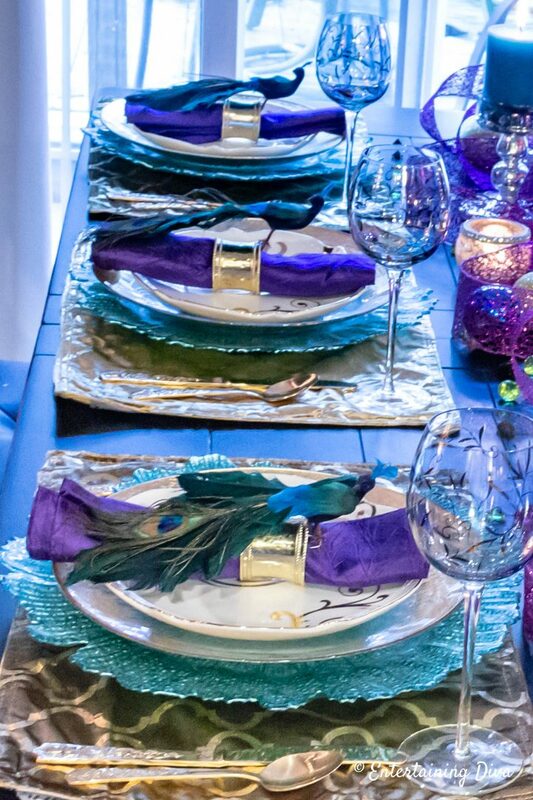 To go with the Mardi Gras color scheme, I used purple napkins, which also goes very well with the peacock colors. For the rest of the place setting, I used a lot of gold with a little bit of turquoise to add some color. The gold adds a bit of glam, and the turquoise makes the place settings above it stand out. I started with gold place mats and turquoise chargers*. Then I added some gold-rimmed plates with white and gold accent plates and gold cutlery. (I bought this cutlery set off eBay for next to nothing). 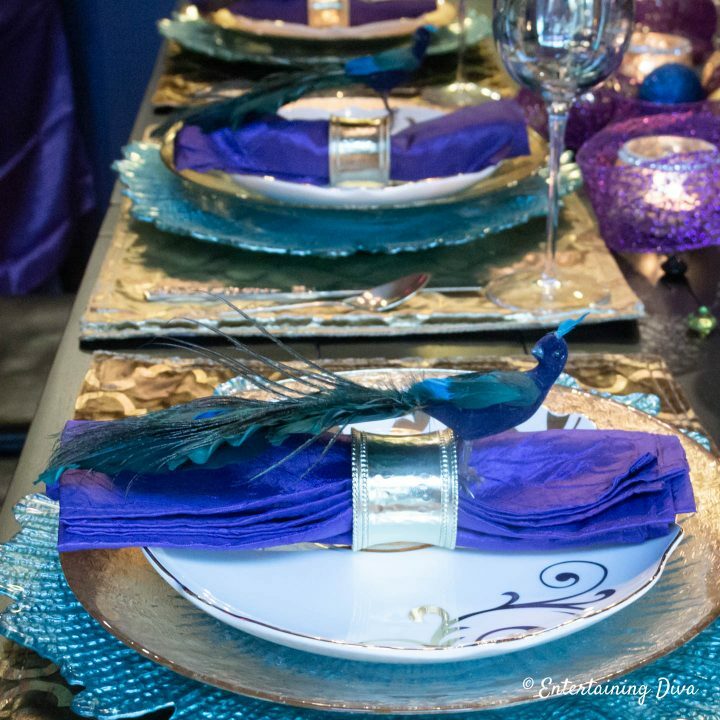 The blue and gold wine glasses were the final touch to my peacock place setting. 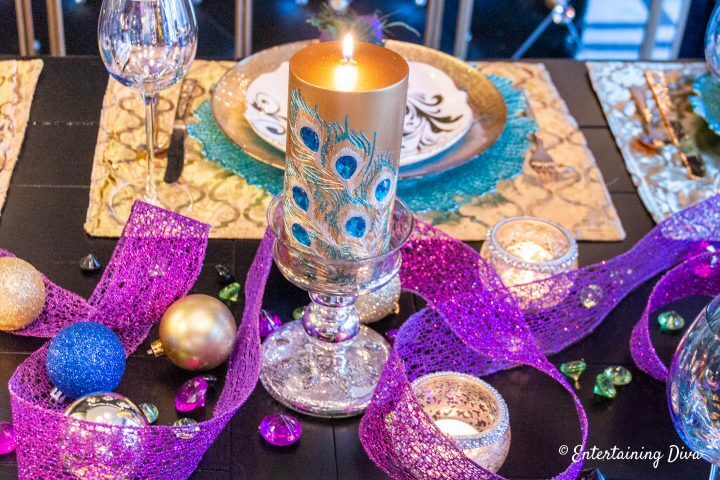 I found these awesome Peacock feather pillar candles in gold which were the perfect thing to start the centerpiece. 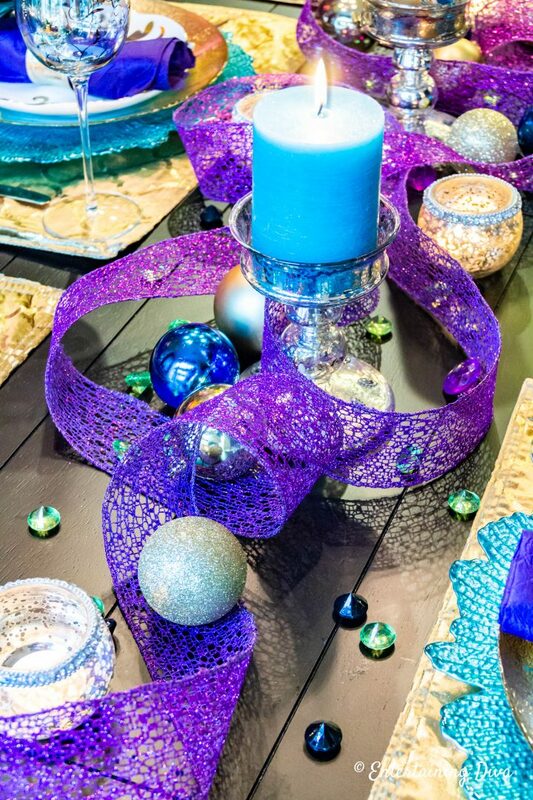 After adding a couple of plain turquoise pillar candles, I trailed some purple wired ribbon down the center of the table. I love using wired ribbon for creating table centerpieces. You can get it in any color to match your table decor, the wire holds the shape that you put it in, and it covers a lot of space for very little money. Finally, I filled in the gaps with little mercury glass tealight candle holders*, some plain Christmas ornaments in purple, blue and gold, and some acrylic table scatter in purple* and green*. Another one of my table setting “rules” is that the centerpiece needs to be low enough that people can see (and talk to) each other across the table. This easy peacock-inspired Mardi Gras centerpiece definitely accomplishes that goal. 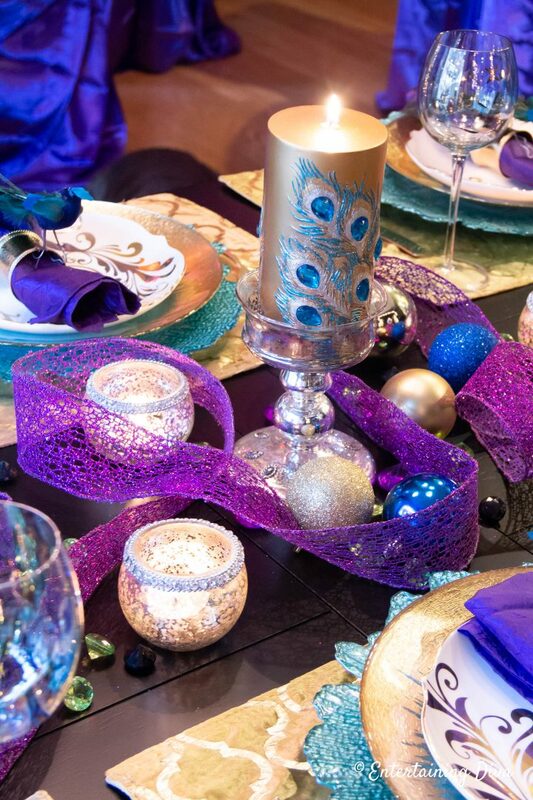 Since I happen to have a buffet near my table, I decided to take the peacock theme one step further, and create another one of my favorite party decorating ideas…ostrich feather centerpieces. For this one I used peacock colored feathers for the top and Mardi Gras colored beads in the vase. Get the tutorial for making ostrich feather centerpieces HERE. 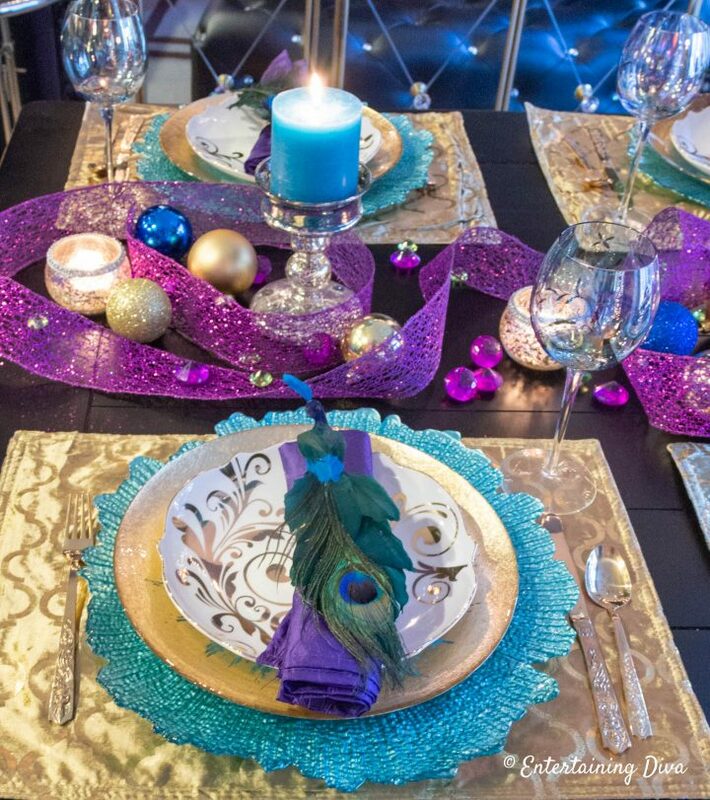 Have comments or questions about the peacock tablescape we used for our Mardi Gras table setting? Tell us in the section below. 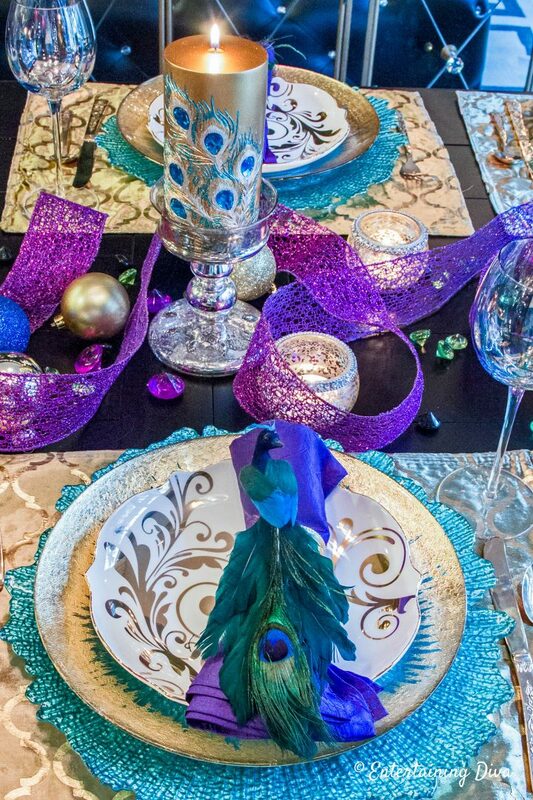 Wanda, your Peacock tablescape is ABSOLUTELY TO DIE FOR. You found my weakness — Peacocks. And thanks for introducing me to KoyalWholesale.com. What a great site. Thanks, Sandy! 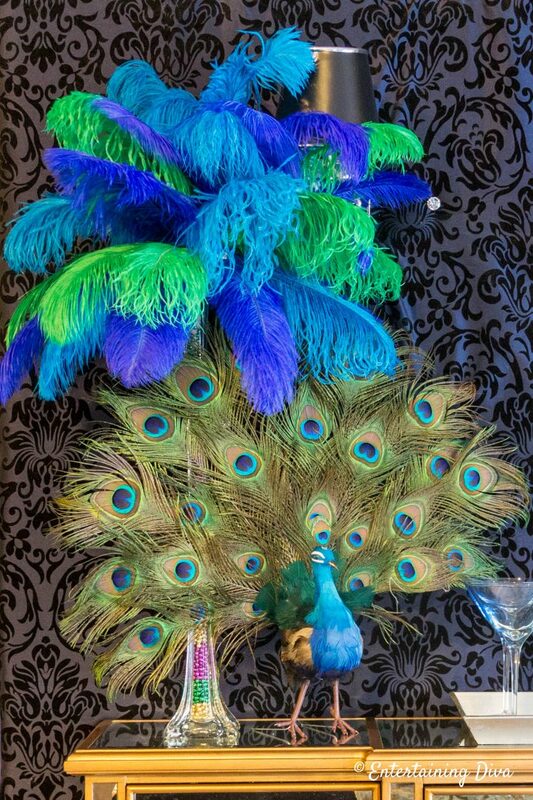 I’m pretty partial to peacocks, too 🙂 And I love Koyal Wholesale for all kinds of entertaining supplies.